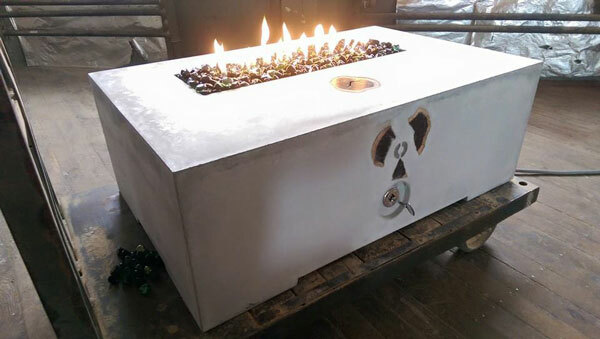 Jason Gillis of OASIS Custom Concrete Designs in Leominster, MA has a business that’s been steadily building steam since he attended The Concrete Countertop Institute. Formerly a flatwork concrete contractor, Gillis has been working on artisan concrete projects for major designers in the area he services. Gillis is currently working on the home of a well-known contractor who has built properties for famous athletes in MA. The home will be part of the Wellesley Kitchen Tour. “Three thousand designers per year are going to walk through the house. They gave me a master bath, a Jack and Jill bath, a half bath, and a six-foot bar downstairs, all in the same house,” Gillis said. Gillis has put a lot of effort, and creativity, into building OASIS Custom Concrete Designs. He went to work right away after getting his education at CCI. Gillis attended the Pro GRFC with Fabric Forming & Fire Pits class in April 2014. He found the curriculum at CCI to be a bit overwhelming at first, even with many years of experience in concrete work. Not one to back down from a challenge, however, he finished his classes, bought a starter kit and the tools to go along with it and spent the first eight months of his career as a concrete artisan working out of a very modest space. “I went home and bought a 20’x10’ carport for $300 and that’s where I started,” he said. By the end of the eight months, he was ready to move to a bigger space. “I ended up in a building that was owned by a master cabinetmaker,” he said. The cabinetmaker was impressed with Gillis’s pieces, an opportunity that Gillis made the most of. The networking turned out to be a huge boon for Gillis. In addition to the cabinetmaker, Gillis shared the space with carpenters working with reclaimed wood and a variety of other tradespeople. After they passed word about his work to their clients, he found himself getting offers for more projects. 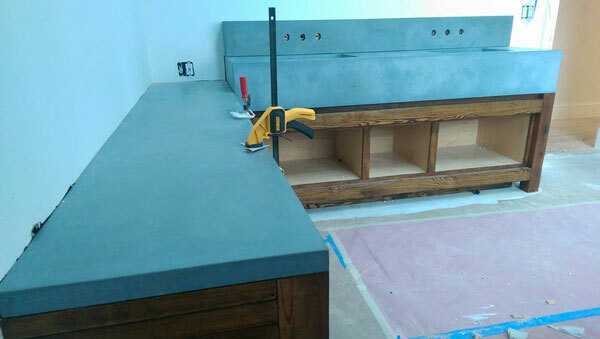 One of the people he was put in contact with had been looking for a long time for someone who could provide concrete countertops. Gillis, because he had worked hard to get his name out, ended up getting that client, which has turned into a lot of projects for OASIS Custom Concrete Designs. As Gillis picked up more work, his momentum kept growing. The work Gillis did in a client’s bathroom caught the eye of a tile showroom owner in Newton, MA, a wealthy area of Boston. The shop owner expressed an interest in displaying Gillis’s work. 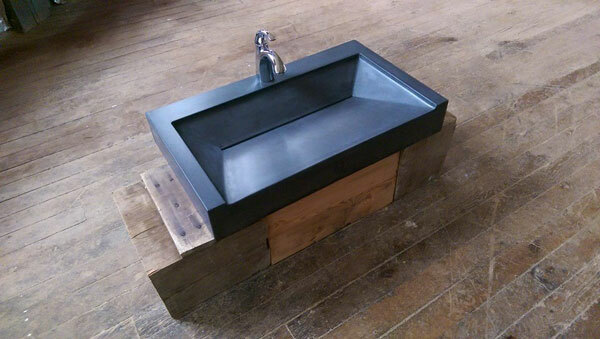 “I brought him a sink and he put it right by the door in his showroom. If it’s not the first thing you see going in, it’ll be the last thing you see going out,” Gillis said. 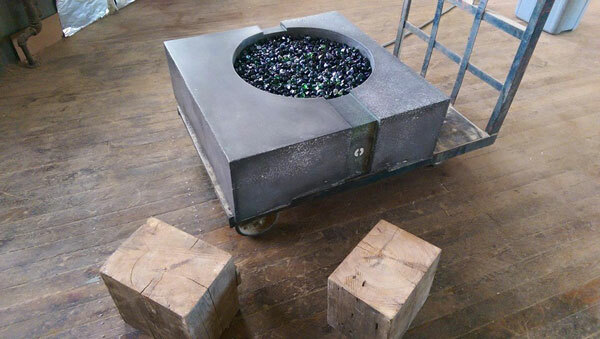 He’s also gotten to take his work across the country, delivering a fire pit to a couple in Yuma, Arizona. The couple happen to both be officers in the Marine Corps. “I’m sure they keep good company,” Gillis said, noting that other military officers might see his work and want a fire pit of their own. He branded the piece, so anyone who sees it will know who to ask. OASIS Custom Concrete designs has a very detailed Facebook page. Gillis features his work on the page, along with photos and videos of his processes. He currently has several reviews—all five stars—and a following that interacts with his page. He even held a contest to rename some of his sinks, with the winner getting a pair of custom candleholders. Gillis also networks with other concrete countertop artisans online and regularly gets offers to pick up projects doing flatwork. “I’m really only sleeping when I fall down in a soft area,” he said. Though Gillis is accustomed to working with a large crew, his concrete countertop business is a much different endeavor. Formal education also proved to be vital to his success. Gillis noted that the skills he learned at The Concrete Countertop Institute were foundational. “CCI is the basic institution for learning this trade,” he said. Gillis had explored other options for business, but is more than happy with working as a concrete countertop artisan. It was a big change in his life, but one he’s embraced. He highly advised being persistent and not being afraid of taking a chance.